What do you get when you mix an unbelievably dull and predictable plotline, some good old fashioned heavy handed moralizing, and some of the most one level boring mook fights ever? You get a 1 star review thats what. Although I played at a different table than the one Quentin bases his review on, I agree with him: the plot is so predictable that you expect a final plot twist that never comes. For my part, I played the low tier with 6 players, all in tier: the combats were a walk over without any significant threat or challenge. I myself was also irritated by the way the goblins were shoe-horned into the story to either explain or promote their introduction into PF2: it felt forced and out of place. It also felt as if this scenario could have taken place anywhere else: the things that make Katapesh a special place were never really shown. Decent scenario, if it were from 8 years ago. 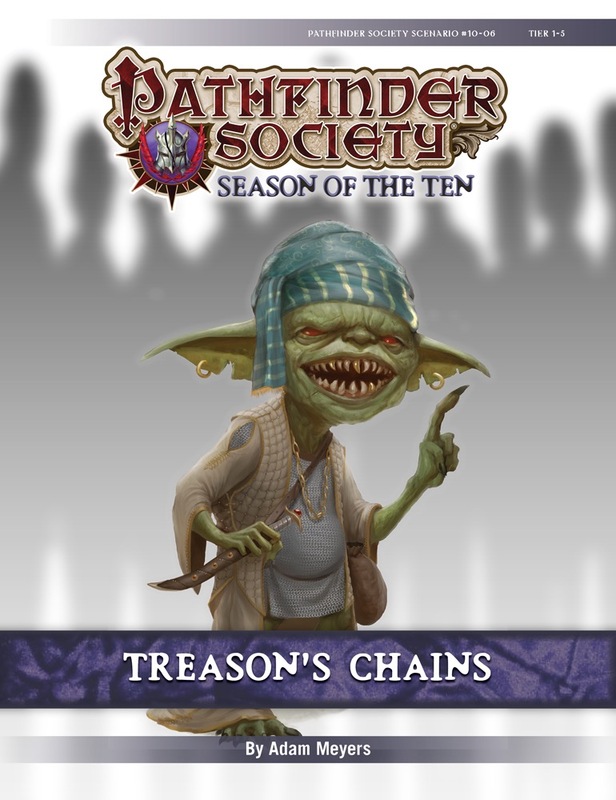 We all remarked how blatant the "Goblins aren't necessarily evil"-push is regarding Pathfinder 2. The author tried really hard to show them in a good light to promote Goblins as good guys, in a way that kinda broke immersion. That said, Zigg (sp?) and the Gobfather were amazing. We were on the verge of high tier, but played down. That has a big influence on difficulty. But even with that, I'm sad that there was almost no variety in combats. They're all melee types without any tricks up their sleeves. Combats could've been so much spicier without being more deadly, but sadly, that didn't happen. All in all, it's a decent scenario, but it doesn't live up to the quality of writing I expect of Season 10. Do we have a listing of what maps will be used in this as yet? Pathfinder Flip-Mat Classic: Pub Crawl and two custom half-page maps. So, is this going to be a mystery similar to Murder on the Throaty Mermaid? I enjoyed this one. I think it did a great job setting up goblins for PFS2 as a playable race.